New Buffalo, Michigan. 17 October 2015. I found my first juvenile Thayer's of the season yesterday - bittersweet looks at a bird that fled almost the second I spotted it. There were also 2 adult Thayer's present (bringing my total to 11 distinct Thayer's in the last 2 weeks). Both of the adult types were without P10, a much more typical molt state for our earliest arrivals here on southern Lake Michigan. 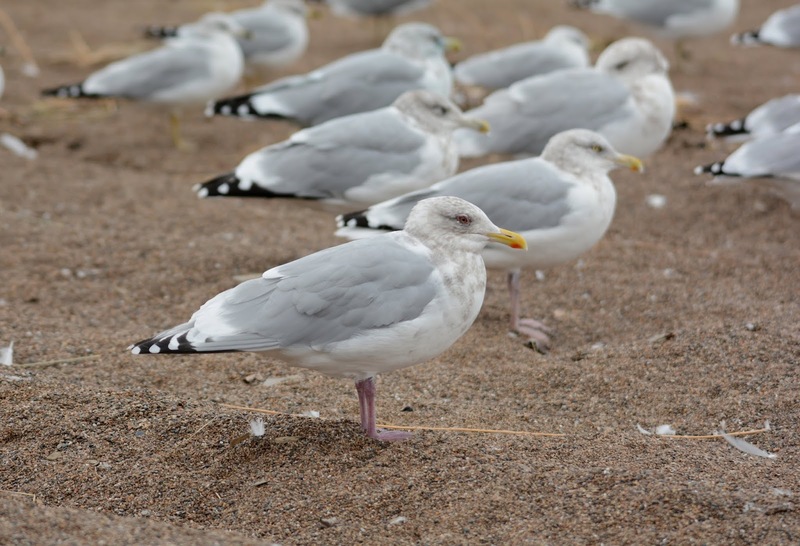 Thayer's Gull (center). A relatively pale-eyed individual. Herring (left) with pale-eyed Thayer's (right). A darker-eyed bird with a duller bill pattern. I've stopped counting adult-type Lesser Black-backeds at this point. From here on out, the only adult LBBGs that I count at this site, for the rest of the season, are distinct and obviously "new" arrivals. Out of the 4 birds present yesterday, a 3rd cycle type and a juvenile were "new" birds that I've not seen this season. The majority of the Juvenile LBBGs that I see in the Lake Michigan region have broader scapulars with rounded, convex edges. This semi-hollyleaf pattern is not something I often see. Also, the notched tertial tips show patterning that I don't normally get. Broader and plainer scapular edges, as well as plain tertial tips. Band #1106-13208. Banded on 20 June 2009; 7E of Chambers Island. Door County, Wisconsin. Bill and body size suggest this is a female. Me on New Buffalo Beach reading a Herring band. Photo by Mike Bourdon. I was happy with finding an adult Thayer's last Sunday (04 October 2015) and mildly wrote it off as a fluke - an early arrival for our region. Yesterday, 09 October 2015, I found 3 more adult types in Berrien County, Michigan, some 85 miles to the southeast. All of the photos below were taken in New Buffalo, Michigan on 09 October 2015. P10 with white tip, retained. Both P9-P10 retained (see open wing below). This may be the first time I've observed 2 retained outer primaries on a Thayer's. Further, I feel the wingtip on this individual is intermediate. 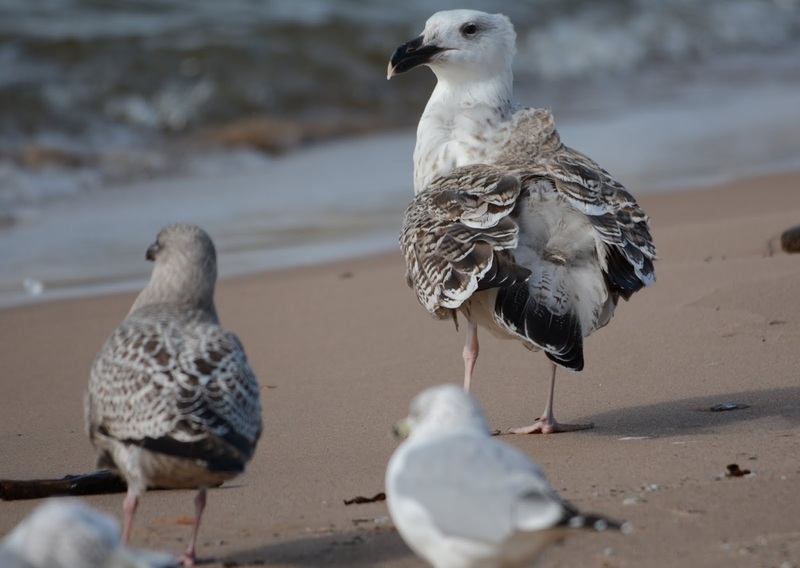 What you'd like to call this bird is your prerogative. 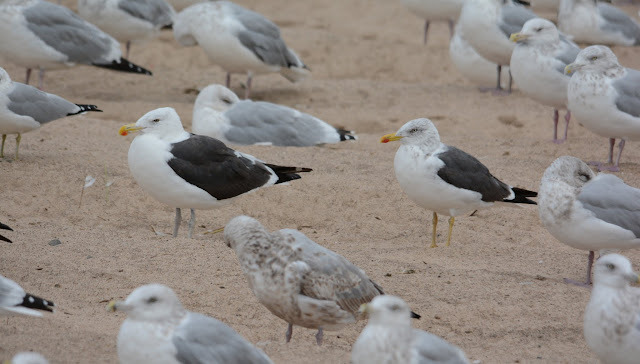 I used to think seeing this species on southern Lake Michigan during the first half of November was "early". I then learned late October is a good time to "start" looking for them. This is actually the first year I've made an effort to look for them in early October...and here we go. I'll have to see what next year brings! The Herrings appear 1-2 shades too dark, as is so with this presumed Herring x Kelp. Shown here with a Lesser Black-backed. Leg color is considerably different. March, 2015. Michigan City, Indiana. 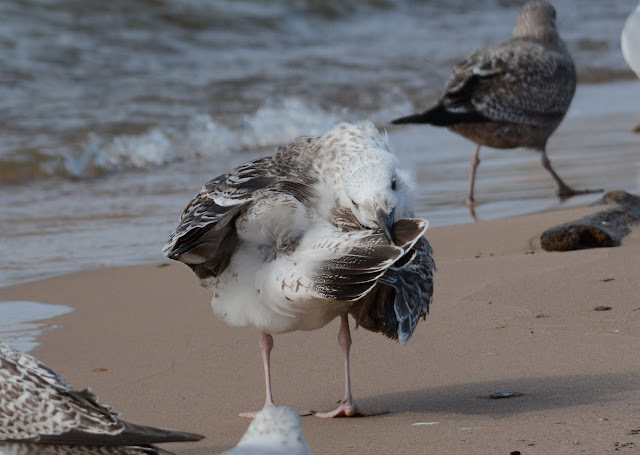 Would I bet the farm that this is unquestionably a Chandeleur Gull? No. Would I bet half the farm? Yes. 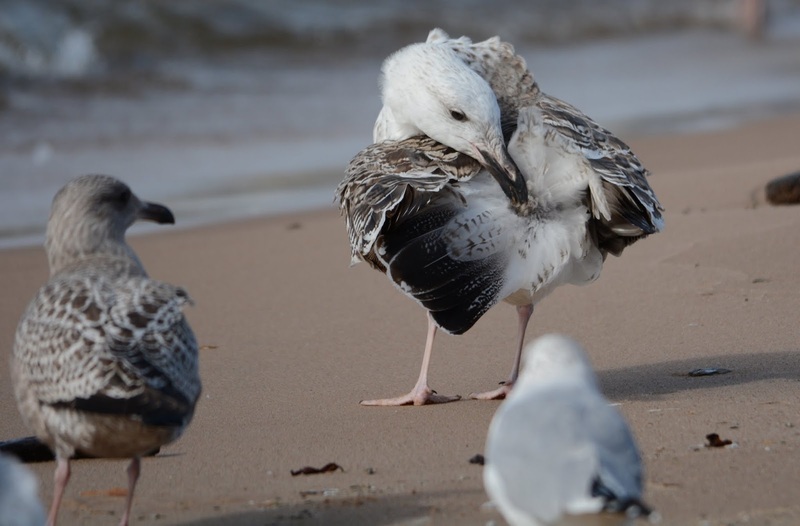 2nd cycle Great Black-backed Gull retrieving preen gland oil. Feather maintenance at its best. 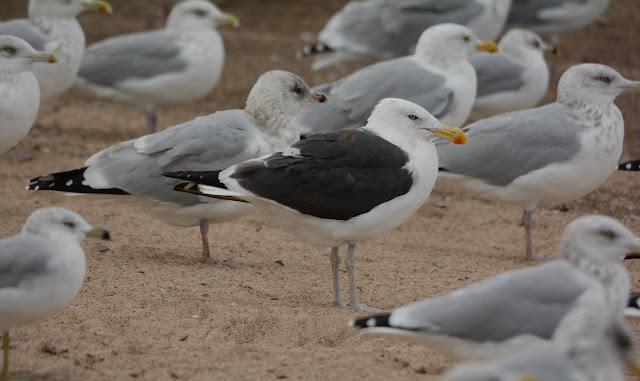 3rd cycle type Great Black-backed Gull (open wing below). Brown wash to wing coverts and central tail feathers. And Lessers - 8 Total! Lesser Black-backeds have peaked on southern Lake Michigan. I've noticed for the last 2 years that they arrive in good numbers in early Fall but then drop off by early December. We may have a North American population that's not as hardy as our Herrings, moving south as soon as we get our first freeze. The fact that their winter stronghold is in Florida may agree with this notion. 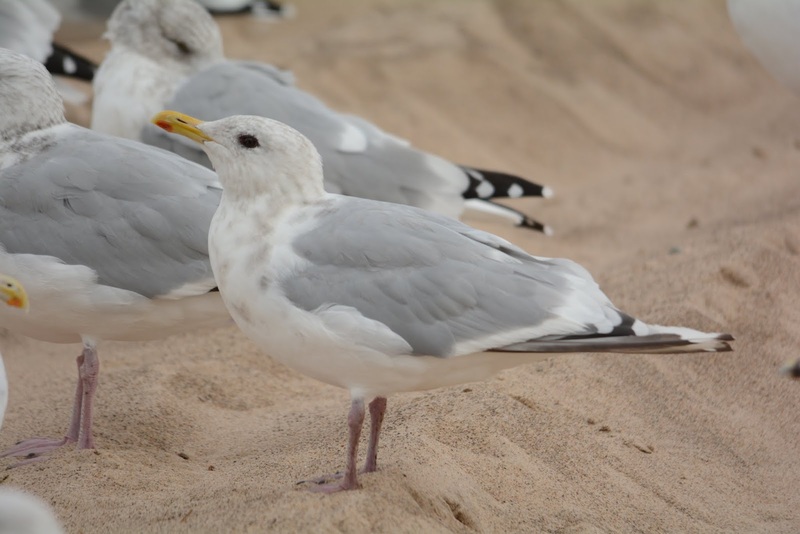 Although admittedly, there may be several factors that contribute to why this species has favored the Florida coastline in winter. 3rd cycle Great Black-backed with 2nd cycle Lesser Black-backed. Adult type - showing mirror on retained P10 on opposite wing. Sub-adult type - no mirror on retained P10 on opposite wing. This first weekend of October was eventful and full of interesting gulls, to say the least. Let's start with the title birds - straightforward and no ID issues. Somewhat of a surprise is this adult Thayer's. I have always looked for Thayer's in early November and late October, but seeing that states to our north (particularly Duluth, MN) see them as early as late September, I purposefully decided to go looking for Thayer's this weekend. 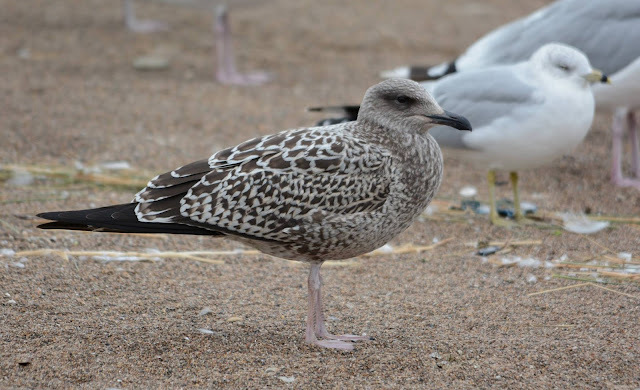 Adult type Thayer's Gull. Lake County, Illinois. 04 October 2015. This is now my earliest arrival for this species. Prior to this my earliest was 19 October 2013 in Illinois & 18 October 2014 in Indiana. Notice p10 is still hanging on. Usually, when we see our first adult THGUs, they've dropped p10 and are about halfway done growing p9 with small hints of the tip to a new p10. It's interesting that sites to our east (southern Ontario and New England) begin reporting these juveniles the first week of September. I usually don't find my first juveniles until about mid-October. The medium gray scaps have dark-centered shaft streaks and overall did not look like any Herrings I've been seeing (until the day after, of course). The bicolored bill is small, the gape appears to frown down (like CAGU) and the tibia shows hits of blue. Same individual above. LWHG. New Buffalo, Michigan. 05 October 2015. I suppose everything on this bird can be found in typical Herrings, but there was something about it - an initial instinct - that looked different, structure and size too. Unfortunately, it was raining, windy and my autofocus wasn't working (and still isn't), so no flight shots. 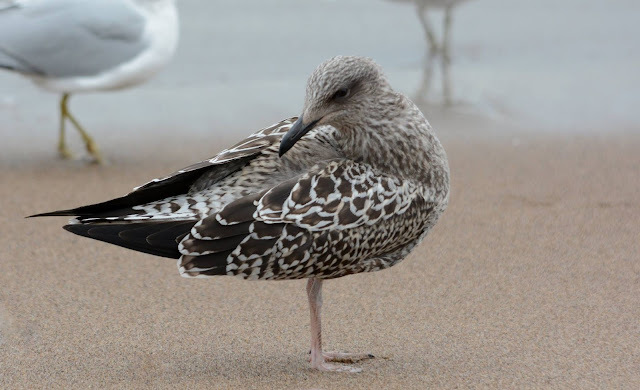 It did appear to have inner primaries that lightly contrasted with the outers, but not a full-blown pale window that is generally found in Herring Gull. I don't recall it having a strong "second" secondary bar formed by dark greater covert bases. 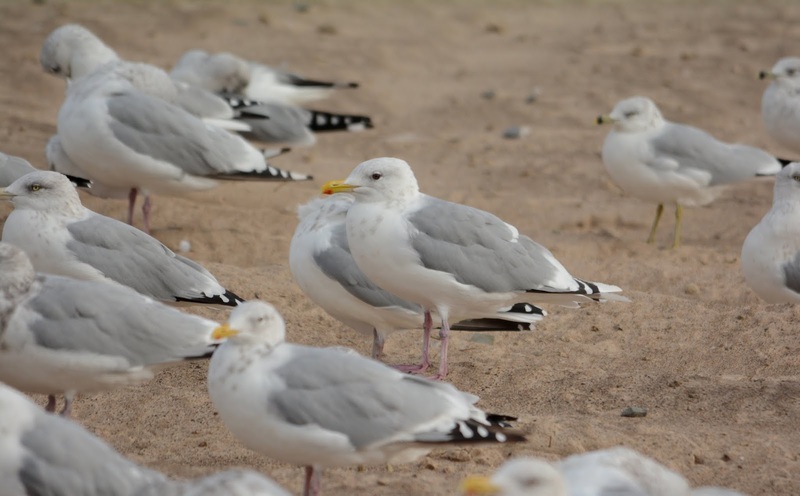 I've identified all of the individuals below as Herring Gulls, some less obvious than others. 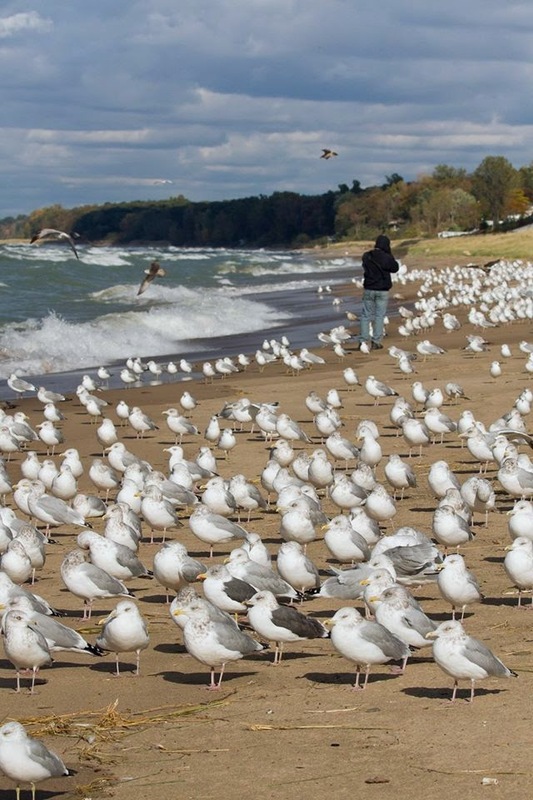 Al of these birds were photographed in Lake County, Illinois on 04 October 2015. 2nd cycle Herring. A very fine pattern of barring to the pale upperparts. White head, frosty 2nd generation scaps. White body, worn wing covets and dark 2nd generation scaps. The scaps are patterned with a medium gray color. Longer than expected wing projections. Medium gray 2nd generation scaps. Wing coverts are plain and appear subdued (faded already?). The overall solid caramel color to this bird appeared different. The color to the primaries is lighter than the bill. Again, medium gray color to the 2nd generation scaps. The fine "zig-zag" pattern to the wing coverts looks like something one would find on a Glaucous Gull (but of course much paler). 1 of only 2 birds with nearly all juvenile scapulars. It's fair to assume this individual is a late hatch. Or, does it have a more durable juvenile plumage and originates from a much more northern latitude than all of the early molters? The 2nd bird of the day to have almost complete juvenile scapulars (less a few newers scaps growing in adjacent to the hindneck). This one looks like it could be siblings with the bird above. A one-eyed adult that was coming along, I guess. 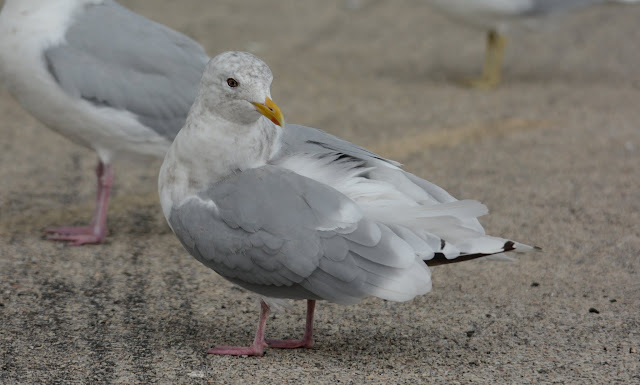 A first for me, this bird has a leucistic left wing and a normal right wing. One would never know if they were only scanning from its right side. Finally, a cross-dresser. Not doing a very good job of trying to disguise itself as a Ring-billed.